Blazing out of the heat of the 2018/19 summer comes the latest issue of NZ Surfing packed with the goods from the shores and surfers of Aotearoa. ON SALE NOW!!!! On the COVER we feature our rising star Kehu Butler who after recently graduating from the junior ranks, is taking the big boys world in his stride and has already notched up several impressive results on the WSL Qualifying Tour. 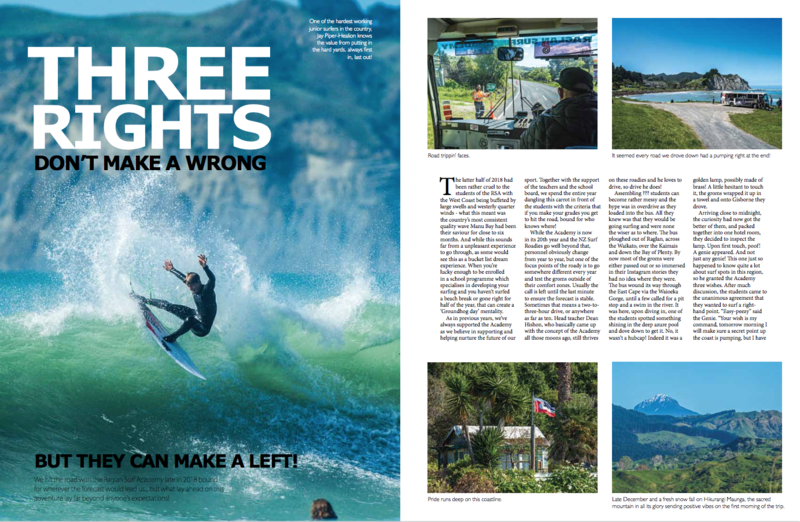 THREE WRONGS DON’T MAKE A RIGHT- We hit the road with the Raglan Surf Academy who spend most of their year going right. The stars aligned and we scored three unique pumping right hand points in three days. 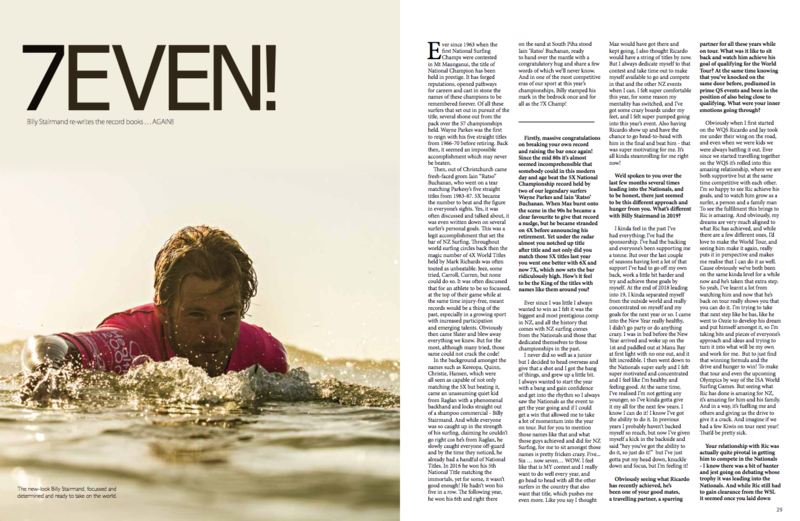 7EVEN- Mr 7X Billy Stairmand just beat his own record taking his National Title haul to 7, we catch up with Billy on his new found focus for 2019 and what the title means to him as well as what he has his sights set on for the coming year. 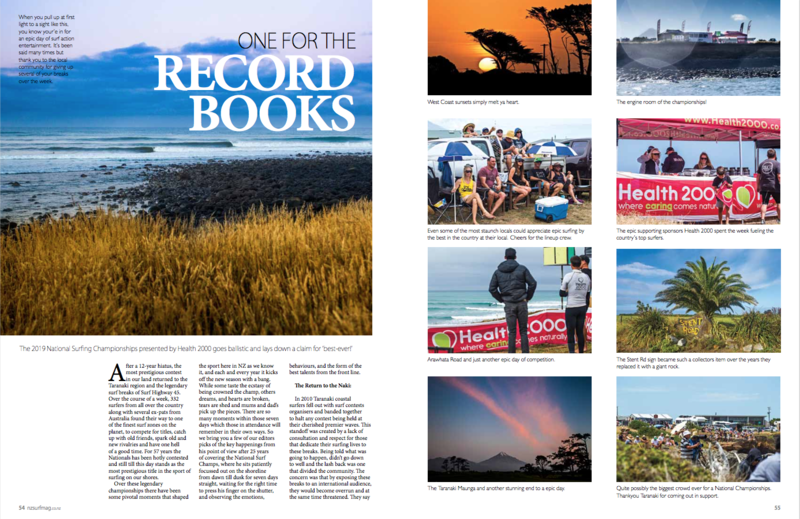 THE NATIONALS: A welcomed return to the Naki after a 12-year hiatus saw a return to the legendary surf breaks of Surf Highway 45 and what sits as one of the greatest weeks in National Champs history. CAPTURED PHOTOSPREAD: Kiwi surfers on kiwi waves caught in the moment and preserved for eternity. THE TARADISE SESSIONS: The week of the National Champs pumped, yet there were plenty of epic sessions going down in between the heats and hooters over at the comp site. 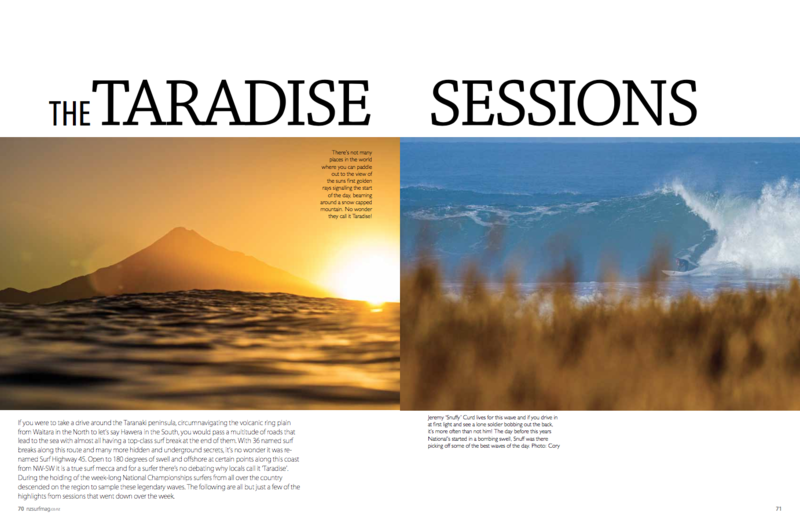 We feature some of the moments that clarify why locals call this place Taradise. The 2019 WETSUIT GUIDE: The latest and greatest technology from the best wetsuit manufacturers on the planet, and word from their Kiwi ambassadors on their experiences with these suits. Design word from the legendary shapeshifter Roger Hall on the mighty single fin. Rising Grom- Taranaki’s Natasha Gouldsbury. 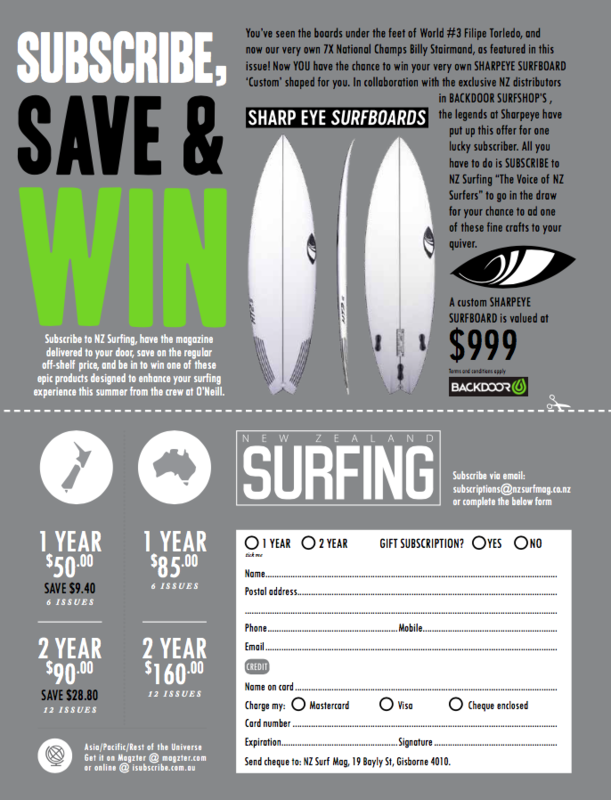 Subscribe to NZ Surfing to WIN a CUSTOM SHARPEYE surfboard. Plus much more NZ surfing goodness from the shores and surfers of Aotearoa!!! www.nzsurfmag.co.nz is undergoing updates on its shop site so please be patient, we’ll get to it when the wind goes onshore!